Military precision extends beyond tactical and strategic elements to incorporate such minutia as how a solider or sailor folds his clothing. 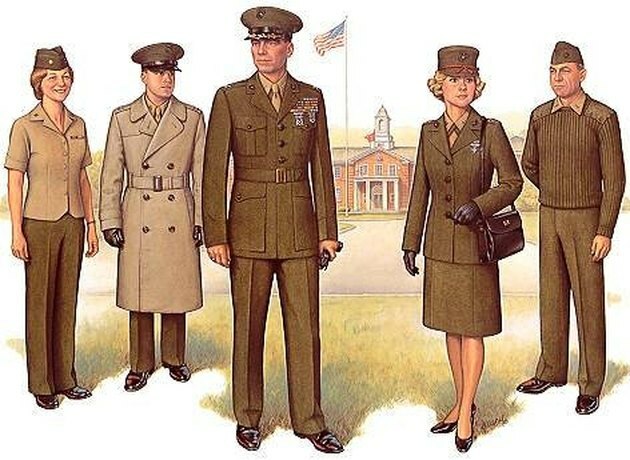 Though it may seem trite, there is a great deal of time and money involved with regards to clothing military personnel. It seems to follow that they should be shown how to fold, store, and care for their uniforms and various sundries. Most military personnel only get a footlocker to house all their belongings. Starting with your dungarees or slacks, turn them inside out, then fold them vertically, one leg over the other. Make sure the crotch is tucked in, making a solid leg line. Then fold the waist and cuffs to the center of the pant leg and fold in half, once. This should provide a perfectly square bundle. Button-down shirts should be laid out, with all the buttons fastened. Fold the sleeves in so the cuffs are parallel to the hem of the shirt. Fold the collar and hem towards each other, leaving 4 inches between them. Fold at the center of the 4-inch space. Lay your t-shirt flat and smooth out all wrinkles. Fold so the hem covers the collar, then fold the sleeves in. Fold in thirds, then fold in half. Finish off by folding the top and bottom towards one another. Pair up your socks and lay them flat. Fold the heels in, then fold the toes up towards the elastic. Roll what is left up towards the elastic, then fold over to hold the ball in place. Lay your boxers flat, with the waistband facing you. Fold the boxers in half, one leg covering the other. Fold the crotch in, then fold vertically. Fold the hem to the waistband. It should be the same width as your folded t-shirt.